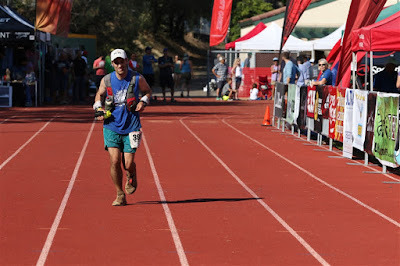 I spent so many years wondering what I might say in a Western States Race report should the day finally come to write one...and yet I find myself here a week after my surreal experience running across the Sierras, with a rather ill-timed episode of writer's block. As a scientist, I don't consider myself a superstitious person, nor a person that lends credibility to any sort of supernatural coincidences. 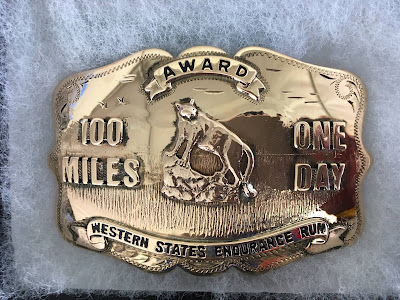 Yet what specifically transpired leading up to the starting gun of this year's Western States 100 run, seems so ridiculously unlikely, that there almost had to be some supernatural force at work. Either that, or I have somehow found myself in possession of a Zaphod Beeblebrox Infinite Improbability Drive that was cranked up way too high (the nerds among you will get that reference). 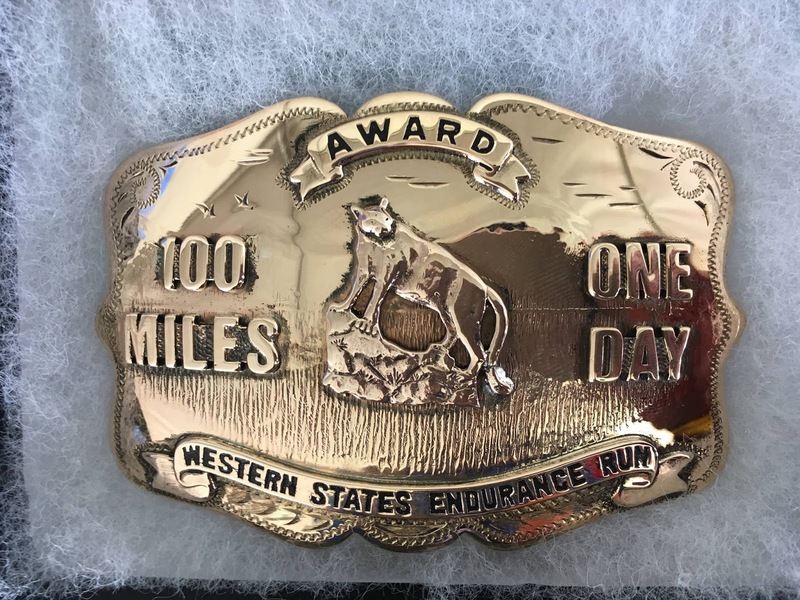 On December 5th of last year, I had just found out that after many years of applying to both the Hardrock 100 and the Western States 100 endurance runs, that I was again not selected for either (see my entry titled Lotteries). I was quite heartbroken with the lottery results. I spoke of my intimate history with these two events and why they were both so special to me, and ultimately why it was that I wanted to experience them both. I noted that there was one "consolation prize" amongst the lottery news, and that was that I had made the Western States new wait list....but sadly all the way down at spot #39. There was no way to know for sure what my odds were for being selected, as the wait list was brand new for 2017; however based on previous years' DNS stats, my odds seemed miniscule. Still, I thought I'd at least see what the wait list did in the first few months of 2017. Perhaps there'd be a spike in early Spring injuries. I figured even if, and that's a BIG if, I were to make it in somehow, it would very likely be a last minute thing requiring a lot of hasty travel arrangements with hefty expenses. 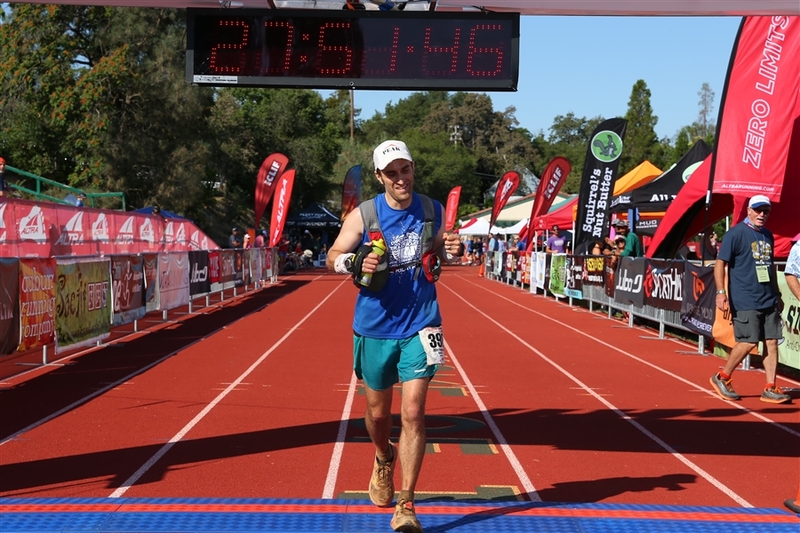 As the early months of 2017 went by and only a handful of names moved on the wait list, my hopes of running Western States all but faded. I had made peace with the fact that 2017 wasn't the year, and that I should simply run something else. So, I signed up for Bighorn 100 (which was 1 week prior to WS on the calendar) and settled in for a long winter of solid training and racing. As the months rolled by a few more names would pop of the list, but as April approached, I was still about 25 names down the list. I had completely given up on wait list and even stopped checking in on it completely. As the Spring pressed on, I focused on finishing up teaching my first class at Boston University and on some occasional racing. I set some new sights on trying to qualify for the Boston Marathon (see Boston Bound), and running some of my usual favorites like Mind the Ducks and 3 Days. 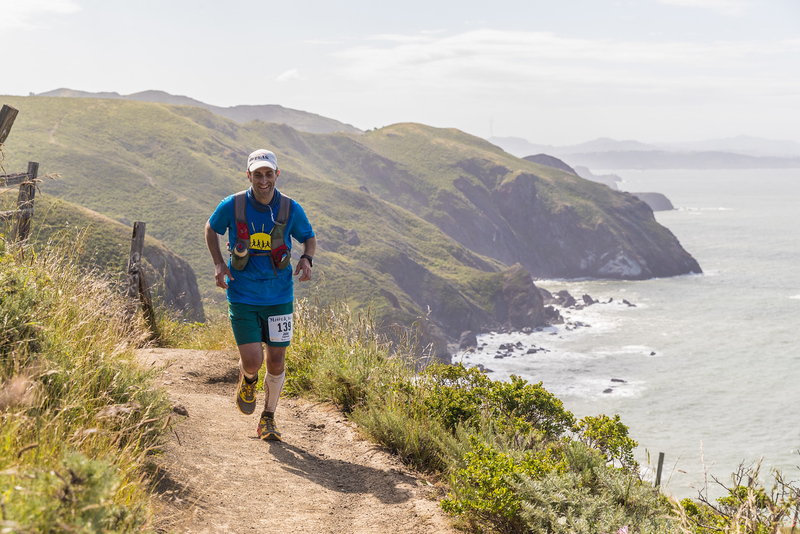 Additionally, I had an amazing race on my calendar that I was very excited about...the Miwok 100k. 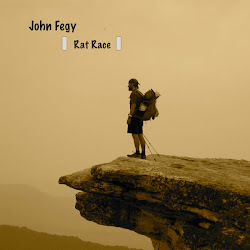 I had decided to make that my late-spring focus race and to really savor the course. I would have family and friends there to support me, and I would get to run along the beautiful coastal trail in the Marin Headlands that I had wanted to run on since seeing footage of the North Face 50 race a few years back (see my brief write-up HERE). 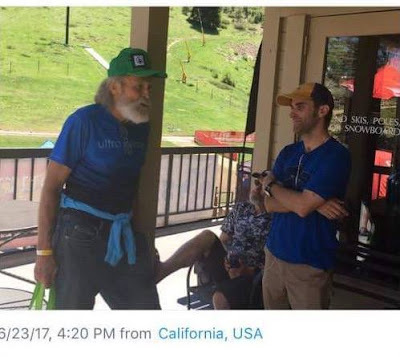 I wouldn't have even applied to Miwok had I been accepted to run Western States, so in a sense, it was my bad luck with the lottery, that allowed me to even run Miwok to begin with. A new member of the 1000-mile club as of this year! Winning my first "Masters" award! As the Spring semester came to a close and my May races were underway, something miraculous happened. 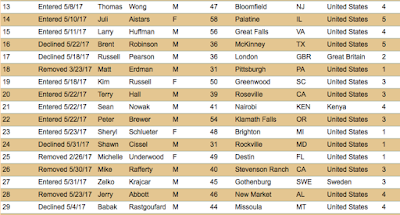 Over the 31 days of May, while I was making loops in NJ and NY, and rolling along the hills at Miwok, the Western States Wait List moved from spot 13, all the way down to spot 29. 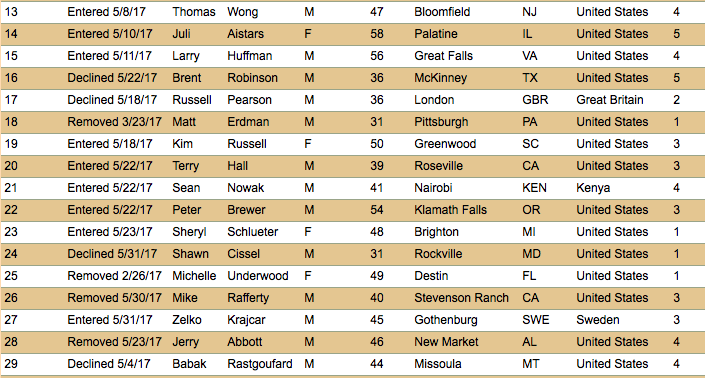 Suddenly, with 24 days until the race, I was only 9 names down on the wait list. In some ways I felt like this was a cruel joke as there was still no way it would drop 9 more names in the final 3 weeks. I felt like anyone that had that last minute panic of "I'm not ready" probably already dropped. Plus, the WS committee was offering refunds if you dropped by a certain date, and one of the big refund deadlines had already passed. As June started, I began working out at the ice lab in Colorado. Spending time alongside colleagues in the ice lab is like a second home to me, and I thoroughly enjoy the work. It's long, arduous hours of plugging away in a -30C freezer, but I love every second of it. We spent 3 full weeks processing over 600 meters of ice drilled from near the South Pole Station. While this was all happening though, small changes on the Western States Wait List were still trickling by. One name at time was falling off of the list as the early weeks of June passed by. On June 12th, I loaded up the Wait List page just to give it one last check, and to my surprise, the list was now sitting at #37....meaning that I was now 3rd on the wait list with a little less than 2 weeks out. My thought was Holy crap...I might need to make a decision. Tired and sore after my first Boston Qualify of 3:06! On Thursday morning, before I was to start driving to Wyoming, another name came off of the wait list and now I was indeed just 2 down. I immediately made the decision that Bighorn was off and I would put all of my hopes into Western. That night I frantically spent hours trying to secure transportation and accommodation in/around Lake Tahoe. I realized very quickly that I would be dropping A LOT of money for a small chance at MAYBE getting to run. I was really quite dejected about this as I was finding it hard to justify spending that kind of money. Rental cars alone for the 5 days I needed one from Reno...were upwards of 100 dollars a day due to "unusually high demand". I thought a flight to Reno from Denver would be cheap...and I was again wrong. I would be spending over 700 on a flight, and I couldn't use any of my American Airlines miles. I was about to give up on it. This is where my other half saved the day. I will never be able to fully thank C for giving up all of her United frequent flyer miles to me, so that I could selfishly fly to Reno with all of my hopes and dreams in a bag with my running shoes. You'll never know just how much that meant to me C. In addition, I managed to find a discounted rate for a rental car and was able to reserve it for less than $40 a day. As far as accommodations, I was able to secure the coziest little airbnb along the shores of Lake Tahoe for about $100 a night. 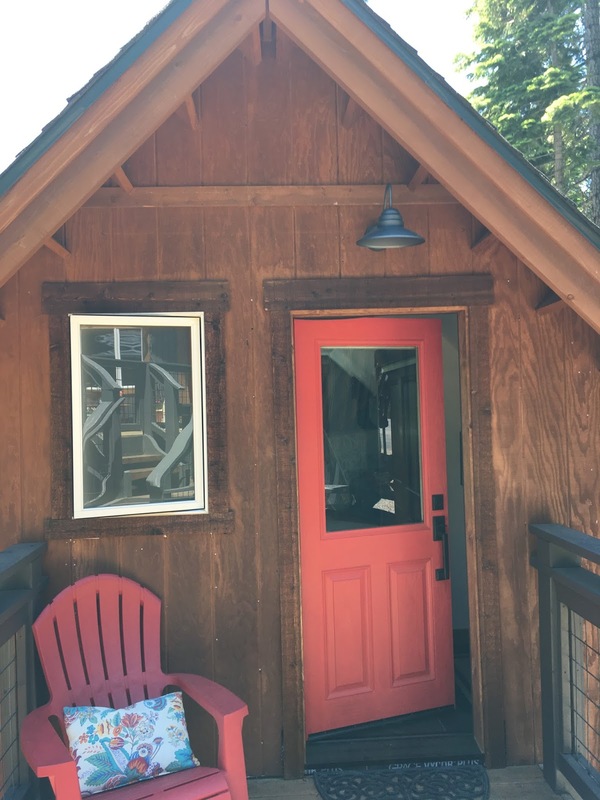 The owners were wonderful people, and I would only be about 10 miles from Squaw Valley. As the final weekend went by and I watched Bighorn runners from afar, trudging through the mud, I realized it was a really good decision that I made not run it. It was brutal conditions this year with extreme mud. On the Monday before Western States weekend (after Bighorn Weekend), I was still #2 on the list and it was beginning to look like the last of the drops may have occurred. My last hopes rested on possible movement the following day. Tuesday the 20th was the absolute last day for any runner to receive any sort of refund if they withdrew (albeit only 25%). I figured if someone hadn't dropped by Tuesday, they weren't going to. Aside from a catastrophic travel interruption, I had assumed that everyone would make the start line. My home while I waited. The timing with my lab work was perfect. 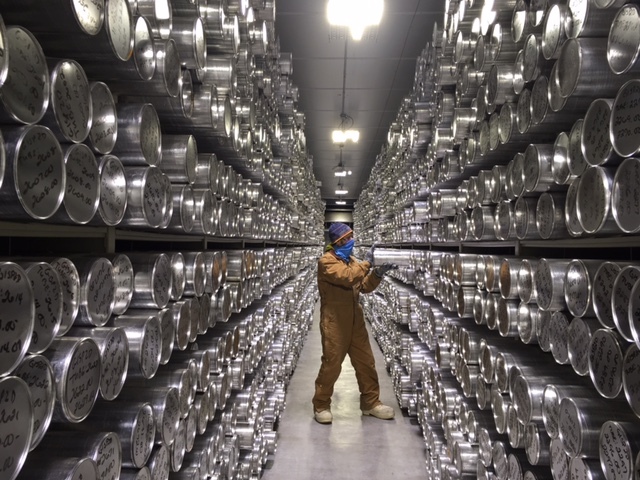 We processed the last of our ice cores on Wednesday morning and I was back at my extended stay apartment packing my gear by lunch time. On Wednesday night I flew out to Reno to play the ultimate waiting game. Every free minute I was obsessively checking my email, hoping to see that message from the race director telling me I made it in. The email didn't come though. On Thursday, I spent the day around Tahoe City at a coffee house working on a long overdue manuscript edit. Eventually, I did make my way over to Squaw just to scope out the scene. I bumped into Jamil Coury who was already interviewing some folks, but mostly it was pretty subdued. I went back to my airbnb and then went out for a short run through the woods. I stumbled across the Tahoe Rim Trail and decided at that moment that if I didn't get in to the race, I would spend the day on Saturday hiking along the TRT. 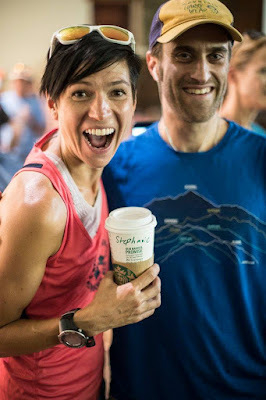 I emailed the race director and the start-line coordinator to tell them both I was in the area, in person, and eagerly ready to run should someone not show up. They both told me to be on "standby" and they wouldn't know until after the check-in process was over at 1:00 PM Friday afternoon. At the point, they'd know if everyone had checked in. No one had emailed indicating a last-minute drop though....so it wasn't looking promising. My hopes on running would have to rely on someone having some terrible travel fiasco (something I wouldn't actually wish upon anyone). It was a rather awkward position to be in because I obviously wanted every runner to show up so they could experience the race, but at the same time had hoped somehow there'd just be one person that maybe decided at the last moment they weren't ready to run. 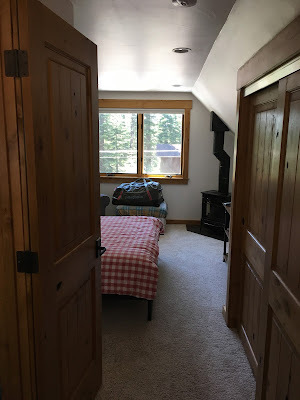 That night as I ran long the Tahoe Rim Trail, I finally got a chance to breathe in the beautiful mountain air near Tahoe, and calm finally came over me. Whatever would be...would be. It was out of my hands at this point, and what a crazy story it already was. The start line...just 37 hours before the start. Still #1 on wait list. View from my coffee house work spot. When Friday morning came, I immediately checked my email...still no msg from the race director. I was still on the wait list. It was after 9 am though, and check-in had begun. Now, I just had to wait 4 hours and I'd know my fate. I made my way over to Squaw and just made an effort to catch up with friends. I bumped into Brad Bishop who was there to crew for some of his friends. 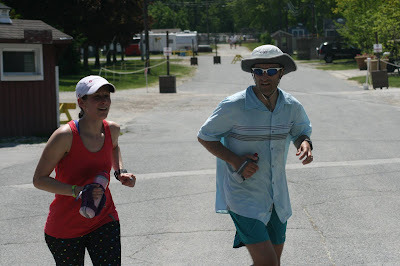 He had told me that should I get in, he'd be willing to pace for me (despite having just run Bighorn the previous weekend). I told him maybe, but it wasn't looking good for me to get in anyway, so was probably moot. The hours ticked by and I was told to wait by the check-in booth to await my fate. I pulled up a chair and began texting home. My message was "It's not looking good". To my left and right were three other wait-listers, all below me on the list, all also hoping for no-shows. Up till this point, I had honestly thought I was the only wait lister that had come out in person to the race. 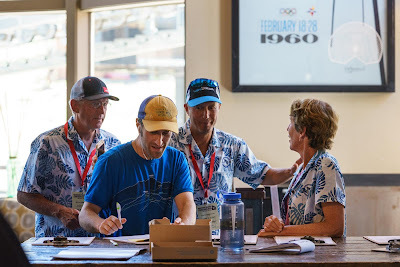 As I was filling out the paperwork, the race director came running in screaming "WAIT, STOP!, HE'S NOT IN! JOHN'S NOT IN!" I thought this had to be a joke right? But it wasn't. In the last minute chaos of check-in, they hadn't realized that the runner that dropped, had actually dropped on Tuesday, and was just reminding the admins that he had dropped. So, that wait list runner that moved up on Tuesday was because of him. In other words, this dropped runner was already accounted for. So, I had to walk with my head down back to my "Waiting Chair" a complete mess. It was such a ridiculous roller coaster of emotion, that I was simply shredded inside. I texted home telling C, "I can't believe what just happened. 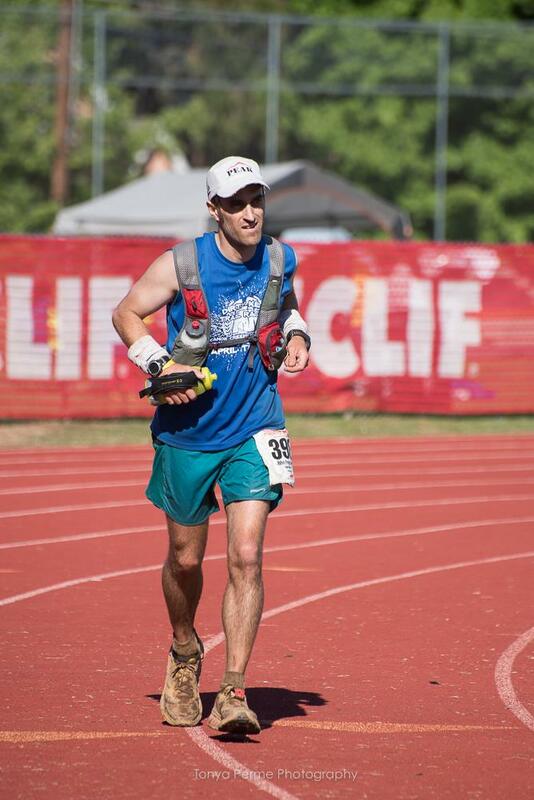 For 3 minutes I was in the starting field for Western States, but was then pulled. Quite heartbreaking to make it this far, with papers in hand, only to be told I'm not running afterall." This picture was taken at the exact moment that I was filling out my paperwork. and that I'm not actually running. 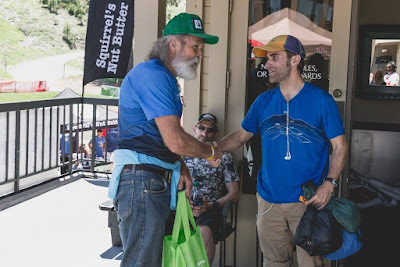 As I sat there packing up, gathering my drop bags, and getting ready to head back to my airbnb, the legendary Gordy Ainsleigh came around the corner to chat with the race director (Craig). 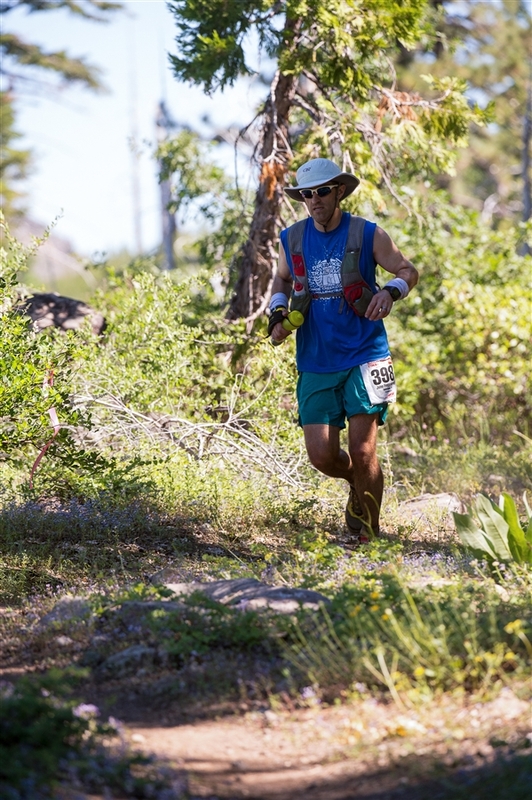 As they talked, Gordy indicated that he didn't think he'd make it past the Escarpment this year (Mile 4) and due to some other issues, probably should just go up the mountain and turn around. Craig said, "You know Gordy, we have a new wait list this year...and this guy sitting here is first on that list. You could just give him your spot". Gordy thought about it, and asked "Well, can we both just run since I'd be turning around anyway?". Craig said that wasn't an option now that there was a wait list. Either he'd run and I wouldn't, or he'd give me his spot and therefore I'd run, and he wouldn't. Gordy thought about it some more (admittedly Craig put him on the spot a bit), but then turned to me and said, "All right. He can have my spot". I looked at him with utter disbelief and in complete shock. "Gordy", I said, "I cannot take your bib number. This is your race! That is your bib number". He simply said, "No, it's fine man. Just take it...Just run a good race and watch out for the heat...it's gonna be rough". ...and just like that, I was now in the starting field.....again. Dave Mackey congratulated me a 2nd time, and told me that I was the only person in history to be entered into a WS starting field twice in 10 minutes. I tried to laugh but was still a bumbling mess. "So Gordy Ainsleigh just gave me his bib number. Holeee sh*t. I'm friggin running western states. I'm running for Gordy tomorrow. Hell yeah!" Moments after Gordy surrendered his bib number to me. I was completely speechless. The last runner to get their picture taken for the 2017 starting field! I frantically got my race bag, and the volunteers pushed me along the line as fast as possible, all while trying to close up shop. They scrambled to throw a bunch of stuff in my bag and even grabbed my drop bags from me telling me "they'd get them to the right place". I was a bit nervous about that, but there wasn't much I could do but say "okay". I headed outside and made the long walk down to the pre-race meeting. I called home in tears, relaying the story to C. She cried too. It was still so surreal. 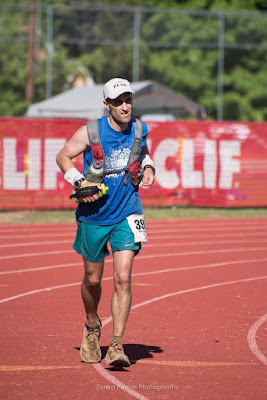 I was going to be running Western States. I had to keep saying that sentence over and over again. I still didn't believe it. As I walked into the race meeting, my friend Stephanie Case, who knew of my predicament, saw me with my green runners swag bag...and she knew I had gotten in. She ran over to me giggling with excitement. "YOU GOT IN! YOU GOT IN!!!" She gave me a big hug and it was the first time I had honestly smiled since finding out I'd be running. Stephanie congratulating me on getting in! Craig (the race director) began the pre-race meeting by telling a story. He started off with "So, I just witnessed something magical happen....". He then went on to tell the crowded room of over 400 people, the story of what just transpired between himself, myself, and Gordy....and how Gordy gave me his bib in order to run. The entire room erupted with cheers and I was again overwhelmed with emotion and simply lost it. I must have looked ridiculous, but I didn't care. I was so completely excited I'd be running along the WS course the following day, that I was floating. I made it through the meeting, eventually found my way back to my airbnb, and finally.....after a very long day, laid down in my bed. I had the most enormous grin on my face. I thought of all the incredible series of events, coincidences, and happenstances that had to occur exactly as they did for me to be lying there...just hours away from a WS start. I simply couldn't believe it was all random chance. Perhaps there really are supernatural occurrences that happen from time to time. I just couldn't explain it any other way. What if I had left 5 minutes earlier from my chair before Gordy came around? What if I was number #40 on the wait list? What if I wasn't in Denver but still back in Boston...would have I actually been able to fly on FF miles? So many what ifs. So many perfectly-timed coincidences all had to happen exactly as they did. It hurt my head to think about it, so I inevitably settled on the entire chain of events being a product of some kind of providence. I quickly put together my running gear for the next day, set my alarm for 3:30 am, and was asleep in moments. I dreamed of "No-Hands Bridge" and myself crossing it at mile 97. It was spectacular. Saturday morning I was up quickly with my first alarm (no snooze) and out the door in the blink of an eye. I was hungry for that start line. As I drove down to Squaw, I was surprised at the lack of cars on the road. I figured that I'd get stuck behind 300 other cars all making their way in. Instead, it was such a lonely drive, that I was beginning to think I had the start time wrong. When I pulled in to the lot, I finally started seeing other runners mulling around. I realized that despite being there an hour before the start, I was actually "late" by other runners' standards. I took one last look at the elevation profile to gauge where and when the big climbs were, and then picked up my bib. It was rather chaotic, so I found a small corner inside to hide in and just relax. Brad met up with me and I gave him my drop bag for the finish line and we talked about the possibility of pacing again. I told him if he wanted to check on me at mile 62, there's a chance I'd take him up on the offer. At about 5 minutes to 5:00, I headed outside and waited by the start line for the final count down. As the seconds ticked by, the goose bumps began to rise. I took a long look up the mountain at all the snow and thought that in just minutes I'd be up there slip-sliding all around on it. I couldn't wait. The announcer said something that stuck with me. He said, "Do yourself a small favor. No matter how many times you've run this race, or if this is your first time...when you get to the top of the escarpment, make sure to turn around and admire the view for a few seconds. It's worth it". Then, there was a frantic final 20-second countdown, and then just like that I was on the other side of the start line and jogging up the road. Before even making it to mile 1, it was already getting light out. I shuffled around a bit position-wise until I found a nice pocket to tuck into. The climb up was a quick hiking-pace until the heavy snow. Then it was a lot of crunching and sliding. We climbed up through several ski slopes until I could see the final pitch up the escarpment to the monument. As I climbed to the very top, there was a good sized crowd already assembled there. Just before cresting, I stopped and turned around letting several go by me. I took in a deep breath and stood jaw agape at the incredible view below me. The valley floor still had an eerie fog settled into it and off to the East the sun was just starting to poke its head up. It was a cool and still morning, and light was bouncing off all of the different snow patches. It was sublime. That image is now burned in my memory and one of the most vivid and poignant from my entire run. After cresting the summit just past mile 4, the descent began with some beautiful and fast dirt trail. I thought, "this isn't bad at all!". But as quickly as it came it was over. For the next ~8-10 miles, runners were greeted with unstable snow bridges, high-angled snow drifts, and knee-deep mud. It was slow going, and incredibly exhausting. In general I probably burned significantly more calories than I had wanted in those first 15 miles. But...I was loving it. Because of my many days on the PCT dealing with snow, I became quite good at maneuvering on snow and knowing when to glisade or shoe-ski down various patches. I passed a lot of people in the high country, but only because many others were a lot less sure-footed in those conditions than me. Honestly, it was the mud that was really the most demoralizing. I had made the foolish decision to not wear my stretchy ankle gaiters...and I was paying for it. With all the mud and snow, I was stopping frequently to empty out my shoes. When the major snow began to dwindle down, I was finally able to figure out what my comfortable rhythm would be. I noticed I was having trouble settling in though. 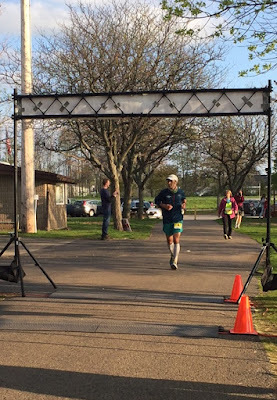 I couldn't find a pace that felt right and was honestly still feeling very tired overall from what I could only guess was my fast marathon the two weeks prior (but probably also simply cumulative over-running during my heavy Spring calendar). I slowed down a lot in what would otherwise be a very run-able section. There was not a lot of snow, still cool, and up in the high country...a seemingly perfect recipe for easy miles (at least on paper anyway)....but I just wasn't quite in that correct zone. I dialed it a ways back and let many of the runners that I had previously passed...go right back by me. I knew had I to conserve my energy for the late-day heat, and I had already spent too much dealing with the snow and mud. So I went into early "grind" mode. Just plug away miles easily and comfortably...whatever pace that is. If I was getting tired, I slowed down or walked...if I was feeling good, I ran. 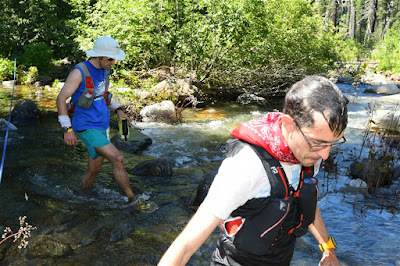 I went through Lyon and Red Star ridge aid stations, only taking a few bits of food. I was mostly relying on my own drink mix and gummies (at least this early in the race anyway). 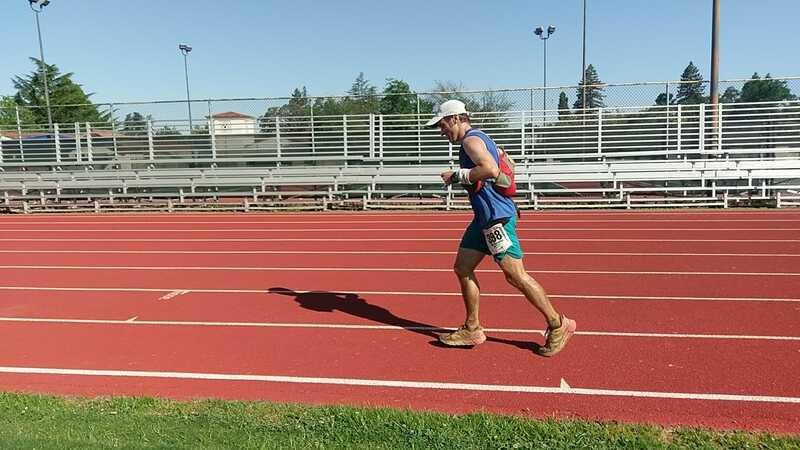 I have a tendency to get sick of aid station food by the end of a 100-miler, so I was hoping to just eat my own food for the first half of the race. Every time I thought I'd seen the last of the snow, inevitably I'd come across one more patch. I remember at one point my watch showed the elevation below 6000, and yet there was still snow present. It was hard to really wrap my head around that considering the temps were supposed to get up over 100 degrees in just a few hours. At Duncan Canyon (mile ~25) I was probably feeling the best I'd feel all day. I was running well, I was hydrated, I was eating...and the conservative slower early miles were paying dividends. 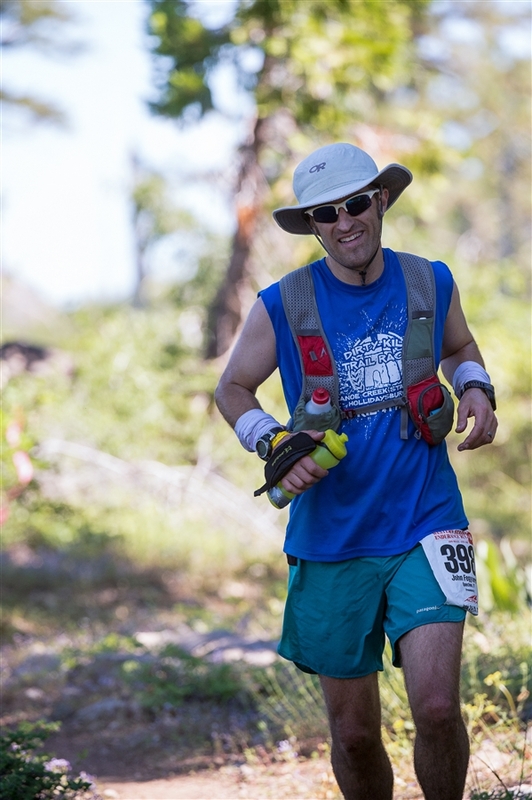 The photographers snapped a few pics as I was coming into the aid station and I was definitely looking like I was having fun. The miles ticked by and I made a mental goal of Robinson Flat at mile ~30. I knew after that station, that there were several miles of very run-able road that I was actually looking forward too. I was hoping to make up a little time there. The heat was starting to pick up a little, but thankfully the course was still high enough and with enough cold creek crossings that I wasn't feeling over-fatigued in any way. At Robinson Flat (mile ~30), I rummaged through my first drop bag and resupplied. I was excited to hear as I left the station that I'd have several miles of run-able road ahead of me. I put myself into second gear and started running at a good pace. Miles ticked away much quicker as I made my way from an elevation of over 6000 feet down to an eventual elevation of of ~4300 at the Last Chance aid station (mile ~42). I went quickly through the Miller's Defeat and Dusty Corners stations in this section as well. These were good miles. I ran with quite a few friends and acquaintances in this section and had some of the best overall conversation of the entire run. The heat hadn't quite set in yet, and I was still so excited to be on the course. I did notice though that my walk breaks were starting to become more frequent than I wanted...especially considering the very run-able nature of the course in this section. Why was my body so tired? Was I not eating enough? Was it the early snow/mud? Was it the heat? Was I simply too sore and unrested from heavy training miles and races? On the descent from Last Chance I was still feeling ok. I ran the entire drop down the river with another runner (Katie) and we had some talk about how to deal with the upcoming heat. Every 100 feet we dropped into this first canyon, the temperature was rising notably. Just like I teach in my Paleoclimate class, normally a dry adiabat will give you upwards of 3 degrees C (5 F) per 1000 feet. This descent was about 1500 feet, so therefore upwards of 7.5 degrees F hotter at the bottom. Add to this that the canyon was very exposed in places with no tree shade, and that stale/hot air was seemingly just sitting there. It easily felt 15 degrees hotter at the bottom of the canyon in the sun. Katie and I both chose to take a 3 minute detour down to the river to lay down in the cool water. It was very refreshing and foreshadowing what would become a theme for the next several hours: River/Creek Dunking. What happened next was what changed my entire race and demeanor. The 1500 foot climb from the river up to Devil's thumb was absolutely soul sucking. It was mid-afternoon, over 100 degrees F, and there was very little shade. The climb was steep and seemed to go on forever. At one point I was so heat-exhausted, I actually had to stop on the climb to sit down. I can't remember the last time I actually had to stop on a climb. 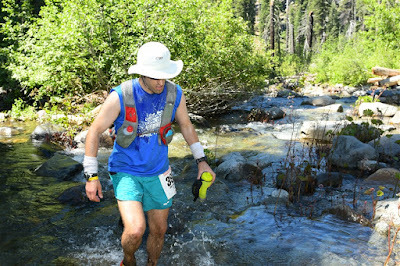 There were no creeks to cool off in, and I didn't want to expend my drinking water over my head. I needed it for drinking. For ever switchback up, my mood grew more sour. I was not in a happy place. I remember passing one runner who was so heat-exhausted he could barely walk. He asked for help and thankfully just ahead was a race volunteer to get him escorted out. He was in horrible shape. "I can't believe I'm this wrecked from the heat and I'm not even at the 50-mile mark yet (Devil's thumb is at 48). There's another canyon right after this with an 1800 foot climb in the hot sun. Maybe....maybe I should call it day right here"
Was I actually and seriously considering quitting? Would my first true DNF (excluding my failed Barkley attempts) be at a race I've waited so long to run? Would I actually quit despite all the drama surrounding Gordy, and my wait list entrance? I thought about it. I seriously thought about it. I lifted my head and looked around. It seemed like a good place to end my day. It was wooded, and quite lovely. But then I noticed something. As I scanned around the aid station I noticed A LOT of runners sitting in chairs. Dozens. I realized that these dozens of runners weren't resting...they had ALL quit. Devil's Thumb was a goddam quit camp. 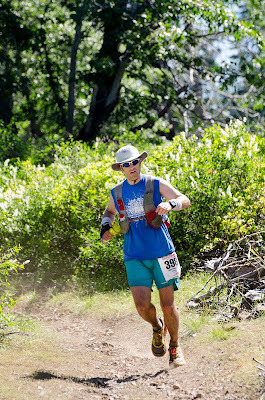 I leapt out of my chair and said the aid station volunteer, "I gotta get the hell out of here!" And I left before I could debate it any further. Within minutes I was half-way down the descent to El Dorado creek and nearing the 50-mile mark. I was happy that I survived the brutal temptation to quit. I absolutely know I would have regretted it. The climb up to Michigan Bluff, despite being slightly hotter, was actually less taxing due to a lower gradient. I took it slow and it went surprisingly well. At Michigan Bluff I was greeted by a wave of spectators and it felt good. The sun was starting to get low in the sky and I could sense that the worst of the heat might finally be over. I fueled up at the aid station and began making my way down the last of the three canyons before the big milestone of Foresthill (mile ~62). The descent was fantastic as the sun was just starting to set and temps were finally cooling off. I picked up my speed a bit and at the bottom I finally began the climb up to Bath Road and the outskirts of Foresthill. As I neared Bath Road I heard a loud "Hey John! Good to see you!". I looked up and it was Brad. 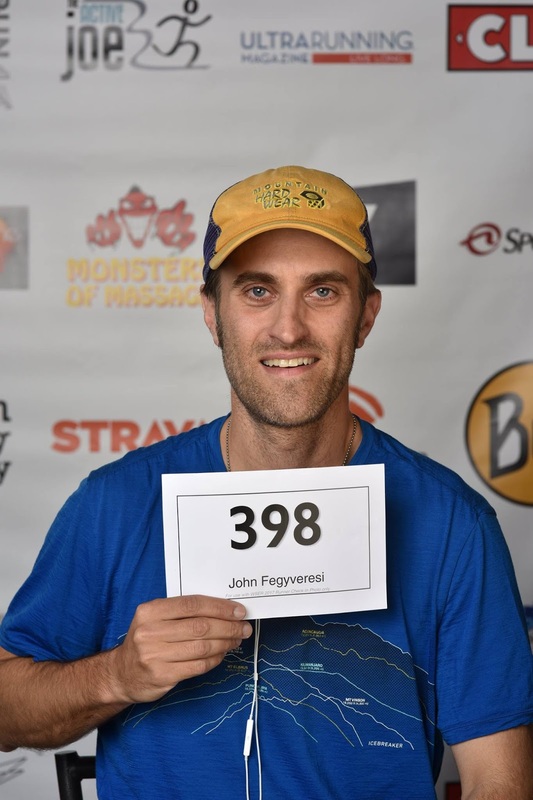 He had come down from Foresthill to await my arrival and had even gotten himself a pacer's bib number for me. He said he'd join me to the aid station and then we would assess from there. I welcomed the company. We trotted down the road together walking and running on and off and catching up about the race. I finally got to hear some news about the race up front. I was pleasantly surprised to learn that Ryan Sandes had taken over first for the men. As I hit the aid station, it was just getting to the point where a headlamp would be necessary soon. Thankfully I timed it perfectly and put my headlamp in my drop bag for the station. I'm glad I didn't slow down too much or I would have had some very dark night running. For miles we trucked on together, trading stories, telling jokes, laughing, complaining, assessing, eating, drinking, grunting, tripping....you name it. It was good to have company and I enjoyed the miles and the course a lot....but was slightly annoyed at my slow pace. 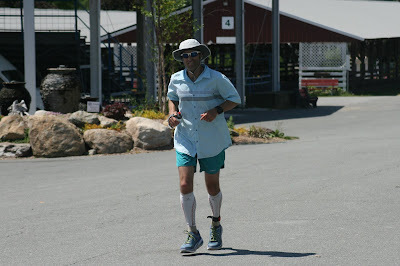 I had realized somewhere early on in these miles that at my pace I was looking at what was likely a 27-28 hour finish. I was bummed that I had so easily let the sub-24 buckle slip away, but I also knew that had I seriously tried to maintain that pace, that I would have been a complete wreck. I think on some level subconsciously I knew that it would likely be many years till I saw the course again, so I wanted to take it slow and enjoy every minute of it. The buckle just wasn't that important to me. What was important, was running on the course, and experiencing all that the Western States Endurance Run is. We made it through the 3 Cal aid stations and at some point in the early wee-hours, we finally hit the Rucky Chucky crossing. I was ecstatic. I had dreamed about sitting in that boat for so long. I was glad it was a high-water year, as I really wanted to cross in the boat and not ford on foot. In some ways, the boat ride reminded me of crossing the Kennebec in Maine on the AT in that sitting in the boat IS the actual trail. That boat ride was another huge highlight of the run for me and something else I won't ever forget. 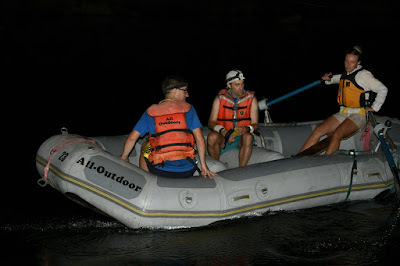 As we exited the boat on the other side, I was eager to tackle the "last portion of the run". There was a little over 20 miles left in the race, and most of it rather tame. I told Brad I wanted to hike hard up to the Green Gate and then hopefully finally start running consistently again. Well when we made it to the gate (in good time too) something just wasn't right with me upon leaving. 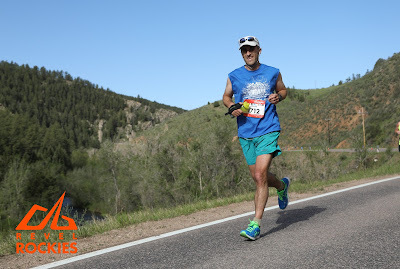 When you've run long distance races and hiked thousands of miles over varied terrain for over 10 years, you just know when your body isn't "normal"...or when something is out of whack. Well suffice it to say, and without going into detail in a public race report, something was off...and I didn't want to push it. I told Brad rather bummed...that I was going to have to take it easy for a while and see how things progressed. Thankfully the course was very forgiving over the next 20 miles and the temps were much more pleasant. So we marched on into the early hours of the morning. Miles ticked by and I remember being so excited to be "In the 80's" (as in miles, not temps). When we hit Auburn Lakes Trails at mile ~85, I picked up my last drop bag and refueled my main supplies for the last time. Things were starting to feel better and my "offness" seemed to be clearing up....but still, I wanted to be cautious. We continued on and very quickly we hit the 90's (miles) and the sun was beginning to rise. We hit the Quarry Rd aid station just after mile 90 and I had a nice chat with Hal Koerner (he was the AS captain). My pace leaving the station still had me arriving somewhere around 28 hours at the finish. I was completely content with that but had made a silent goal of maybe trying come in somewhere in the 27's. At mile 92 I was finally jogging on and off again and I remember being on the infamous road that led to the even more infamous "wrong turn" last year. I asked Brad if the thought it would be marked more obviously this year. We turned the next corner and were welcomed by about a dozen trail flags all pointing to a very obvious turn off of the road and up on to a single track trail. It was almost comical how heavily it was marked. I guess they didn't want a repeat of last year. When we began the descent down to the bridge, the sun had finally come up in full and I was already noticing the rising temps again. As soon as I saw the bridge from afar though, I began running... I wanted to run across the bridge...not whimper across it. Going across that bridge was just as I'd imagined it. It was yet another memory that will be forever burned into my mind. After leaving the bridge, Brad began to warn me of the awful last climb up to Robie Point. He kept telling me that he couldn't remember the specifics of the climb, only that he remembered it being steep. We kept discussing the climb, all while slowly making our way up a dirt road. I realized after about a mile and half of gabbing away on this road, that the climb was nearly done. When we finally did turn off on to steeper trail, it was only for about a half-mile of actual climb. It was the first time I was very glad that Brad was wrong about the course. Up to that point he was my reference guide to what was coming up. My Garmin had died around mile 75, so I had to rely on Brad for giving me details on upcoming climbs. When I could see the Robie Point station coming up, all of my worries, fears, and doubts melted away. All I had left was a 1-mile run along a paved road into the finish Stadium. I stopped to take in a quick drink at the station...with the volunteer again thanking me for having my own cup. A quick aside: the race was supposed to be cupless this year, so I brought a small foldable cup for soda at the stations. Every time I pulled it out during the race, the volunteers were so excited. Many told me I was the only runner to have my own cup. The final mile was painless and soothing. I smiled as I ran my way down the street excited that I had managed to stay under the 28-hour mark. I began recognizing houses and street signs from the "Unbreakable" movie. I knew I was close. I could hear the finish line crowed in the distance, with the announcer spouting off finishers' names. ...and then Brad pulled away and I crossed one final street. I entered through a small gate, and my feet were on the soft, red track. I was all alone. The track was mine. I savored it. I took my time running around the loop, just remembering the sky, remembering the smells, remembering the sounds. I turned the last part of the track and could finally see with my own eyes that finish line. I ran faster, the tears welled up, and I crossed that timing mat with an absolute sense of contentment. Finish Time: 27 hours, 51 minutes, 46 seconds. Yes I ran slower than I had originally hoped....yes I had some new and unexpected issues physically and mentally, but in the end, played it safe and finished strong. 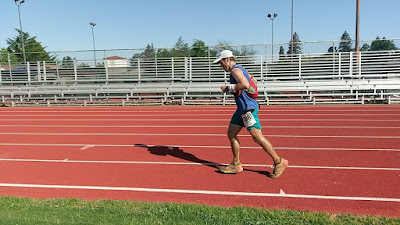 I absolutely loved the course and was in awe of the experience throughout the entire 27 hours and 51 minutes I was out there. Some day, I hope to again experience the WS 100...but for now, am simply thrilled at the way everything transpired. I was honored and humbled to run with Gordy's number, and I hope I did it proud. I know it wasn't an exceptionally fast finish, but it was a finish. The Western States race committee would later release some geeky statistics about the 2017 race; how many finishers, who dropped where, etc. The one statistic that I noticed was their ranking of "most difficult years". They ranked the difficulty each year since 1986, by looking at the median finish times (slower times equalling more difficult). Excluding the two years (1995, 1998) in which the cut-off was extended to 32 hours, and therefore the median times were skewed, 2017 ranked as the 2nd most difficult year of all. The median finish time for 2017 was 27:22, while the median finish time for 2012 (the easiest year) was 24:48. This makes me feel a lot better about my 27:51 finish. 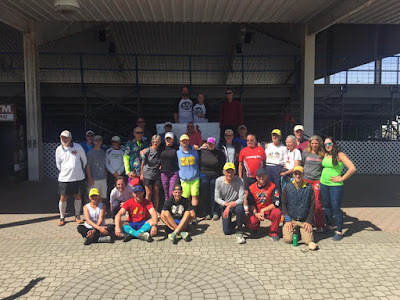 So to finish this very long post off I just want to say a few last-minute "Thank-You's"
Thank you to Gordy Ainsleigh for allowing me to run in your place. I will forever be grateful. Thank you to random guy #38 on the wait list who decided to withdraw rather than stay in. It's because of you that I was able to run at the last minute. Thank you to Brad Bishop who wonderfully paced me for almost 40 non-stop miles, after having just run the Bighorn 100 the previous weekend. I appreciated the company immensely. Thank you to everyone that left encouraging facebook posts, instagram comments, twitter messages, and emails. I was completely shocked and humbled by all of amazing messages both before and after the run. 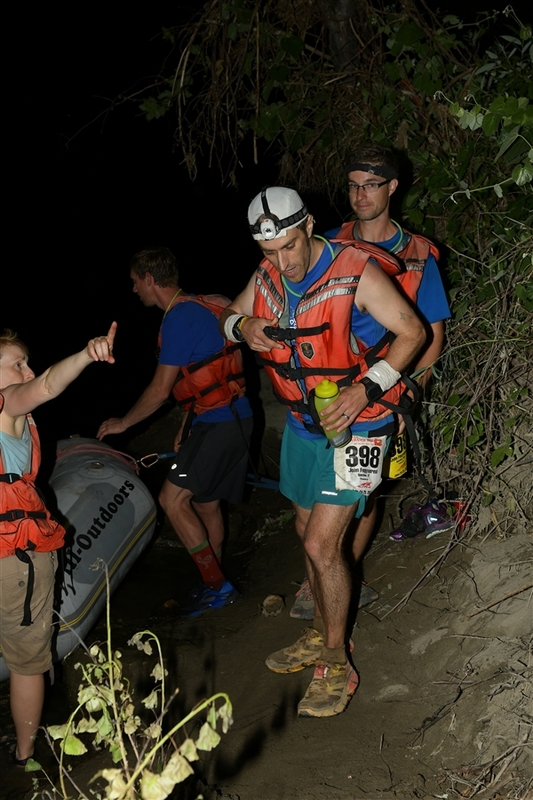 Thank you to all of the aid station volunteers, race admins and officials, river boat paddlers, and trail markers. You all made this race possible. Thank you to all of the runners I shared miles and conversation with out there. You made the day even more special. Thank you random aid station volunteer at Devil's Thumb that told me "I was sitting in the chair too long!" I was, and you were right. Thank you to the other three wait listers (Andy, Michael, and Kelley) who all so graciously congratulated me on getting into the race after Gordy surrendered his number, despite knowing that you were all not going to get in. This was the one part of my entire experience that truly upset me. I fell guilty that I was able to run and that you three were not. I sincerely hope all three of you make it in next year. I will cheer heartily for you all. I know it's no consolation, but trust me when I say that it really is worth the wait. and Thank you to my family for cheering me on from afar.